As cars become more and more quiet, the customer’s perception for the acoustic comfort increases. Therefore the sound quality of cars interior noise has become a very important task for the acoustic engineers. Because the noise level of cars major components such as motor reduces more and more, the noise of cars auxiliary equipments like generator are paid much attention. 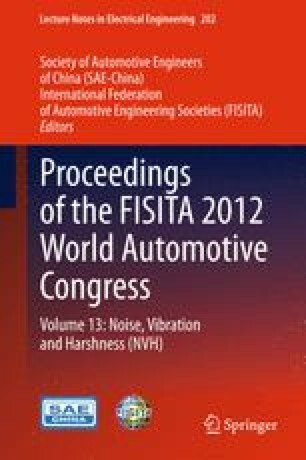 This chapter on one hand analyzed one car auxiliary equipment generator’s disturbing noise source through the whole car acoustic test, found the generator main order problem, and on the other hand studied the generator’s psychoacoustic metrics. In this chapter the countermeasure of solving this problem was also given, and then noise level and psychoacoustic parameters are compared. Both objective evaluation and subjective evaluation showed that the generator with the solution not only reduced the sound pressure level, solved the disturbing noise problem, but also improved the car sound quality greatly. Shanghai Rising-Star Program (B Type) (11QB1401100).